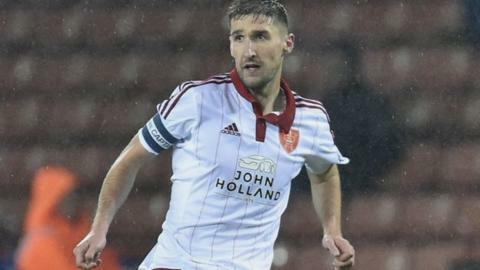 Barnsley's Conor Hourihane atoned for an earlier penalty miss with an injury-time equaliser in the League One local derby against Sheffield United. Chris Basham put the Blades in front on 16 minutes when he headed home Robert Harris' cross from close range. Barnsley should have levelled when Adam Hammill was brought down by Neill Collins on 59 minutes, only for George Long to save Hourihane's penalty. But Hourihane then fired in a left-foot shot five minutes into injury time. After earlier failing from 12 yards, he this time succeeded with a 20-yarder for his third goal in as many games and his sixth of the season. Lee Johnson's Tykes picked up only their fourth point out of a possible 33 from the last 11 games, while Nigel Adkins' Blades are now without a win in six League One matches. Match ends, Barnsley 1, Sheffield United 1. Second Half ends, Barnsley 1, Sheffield United 1. Attempt missed. Neill Collins (Sheffield United) header from the centre of the box is just a bit too high. Corner, Sheffield United. Conceded by Ryan Williams. Corner, Barnsley. Conceded by Jay McEveley. Goal! Barnsley 1, Sheffield United 1. Conor Hourihane (Barnsley) left footed shot from the left side of the six yard box to the bottom right corner. Ivan Toney (Barnsley) wins a free kick on the right wing. Attempt missed. Adam Hammill (Barnsley) right footed shot from outside the box is just a bit too high from a direct free kick. Substitution, Sheffield United. Jay McEveley replaces David Edgar. George Smith (Barnsley) wins a free kick in the attacking half. Attempt missed. Ben Pearson (Barnsley) right footed shot from the right side of the box is just a bit too high. Corner, Barnsley. Conceded by Neill Collins. Lewin Nyatanga (Barnsley) hits the bar with a right footed shot from the centre of the box. Corner, Barnsley. Conceded by David Edgar. Ben Pearson (Barnsley) wins a free kick on the right wing. Attempt missed. Chris Basham (Sheffield United) header from the centre of the box is close, but misses to the left. Substitution, Sheffield United. Kieron Freeman replaces Matt Done. Corner, Sheffield United. Conceded by Sam Winnall. Attempt missed. Adam Hammill (Barnsley) right footed shot from the left side of the box is close, but misses the top right corner. Sam Winnall (Barnsley) hits the right post with a header from the centre of the box. Neill Collins (Sheffield United) wins a free kick on the left wing. Sam Winnall (Barnsley) is shown the yellow card for a bad foul. Substitution, Barnsley. Ivan Toney replaces Marley Watkins. Substitution, Sheffield United. Martyn Woolford replaces Jamal Campbell-Ryce because of an injury. Delay in match Jamal Campbell-Ryce (Sheffield United) because of an injury. Attempt saved. Matt Done (Sheffield United) right footed shot from the centre of the box is saved in the top right corner.